Submitted by Mason Hoberg on Aug. 23, 2017. Chorus is one of the most pervasive effects in the industry, used in dozens of the most famous records ever released. However, like other modulation effects the factors that decide a chorus effect’s overall quality are shrouded in technical jargon. So rather than go in blind, take a look through the pedals we’ve collected. Below are some of the best chorus pedals available. Rather than separating them into analog or digital, the pedals below are all sorted by price. The two pedals below are a great bang for your buck, but don’t expect to find the same features and tone quality you’ll get in the next price tier. 84 out of 100. Incorporating 500+ ratings and reviews. The Danelectro is an incredibly cost-effective unit, and as such is many musician’s first chorus pedal. 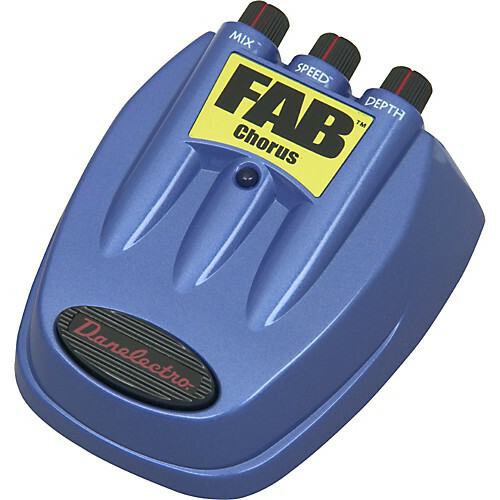 Danelectro FAB effects are widely available, and at under $20 a pop they’re really attractive units for beginning musicians who can’t afford to drop a ton of money on a single effect. However, while the unit is affordable it is also flawed. The main issue with this pedal is, like with many cheap pots, is that the effect’s parameters don’t have an even curve. At low to mid levels the effect is very subtle, with a dramatic increase in the last 10th of the controls’ motion. The unit also has its controls on the top of the pedal rather than on the surface, which can make adjusting the pedal on stage difficult because they are not easily visible. Dimensions: 4.6" x 4" x 2.2"
Surprisingly, the casing, jacks, and footswitch are all reportedly pretty solid. Of course the D5 FAB Chorus won’t hold up as well as a Boss pedal, but at the same time the unit is easily gig-worthy. As far as tone is concerned, the FAB Chorus won’t turn any heads. It’s a viable tone, but when compared to more expensive pedals the unit is a bit thin sounding. 85 out of 100. Incorporating 200+ ratings and reviews. The main appeal of the Donner Tuttie Love Chorus pedal is that it’s affordable and has a small footprint. Donner bills the effect as a “mini-pedal”, which as implied by the name means that the Tutti Love is significantly smaller than your average pedal. An interesting feature of this pedal is that it’s both analog and true bypass, which is rare at the price point this pedal occupies. The tone of the pedal also benefits from its analog construction, because it lends the pedal a warmth that tends to be lacking in this price point. Dimensions: 3.74" x 1.73" x 1.89"
While the pedal is regarded for its warmth, there are musicians who feel that it has too dark of a tone. Though to be fair, this actually might be a good thing if you’re using a brightly voiced guitar. It’s also not considered to be very transparent, so expect a bit of tone alteration when using the effect. 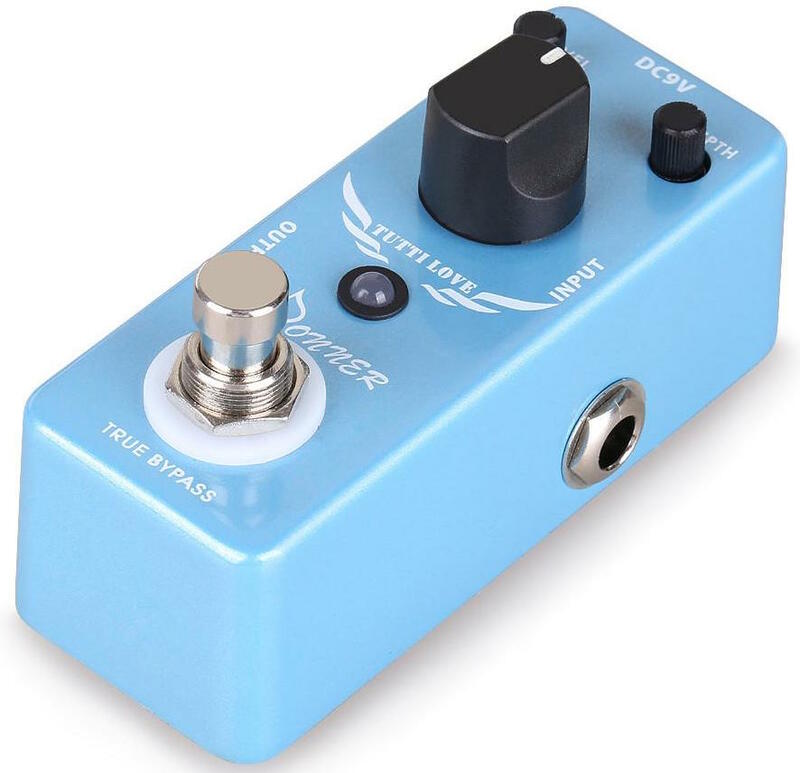 A potential flaw of this pedal is its size, because it’s small enough that it can be a bit awkward to actually find in a venue with poor lighting (which is most venues). Though this might actually be a selling point if you already have a crowded pedal board. The Tutti Love appears to be pretty stable, featuring a full metal shell as well as a solid footswitch. In the $50 to $100 price tier you see pedals that are of a gigging and recording quality, with the main difference between them and more expensive pedals being their respective amount of features as opposed to their tone. 93 out of 100. Incorporating 750+ ratings and reviews. 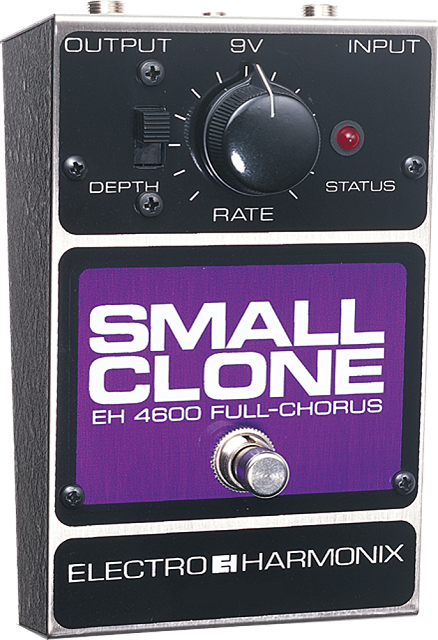 Electro-Harmonix’s Small Clone is best known as one of Kurt Cobain’s go-to chorus pedals. The defining tone of the pedal is Nirvana’s “Come As You Are”, though don’t think of it as “The Nirvana” pedal. Even with the controls being limited, the pedal is more versatile than most would initially assume. The most important thing to know about this pedal is that the depth knob only has two-positions as opposed to the variable switches most pedals have. So basically, you either have a lot of depth or a very subtle chorus. Then, with the rate knob, you control the speed of the pitch modulation. Dimensions: 5.19" x 1.6" x 3.37"
The cool thing about this is that it makes the effect really easy to dial in, and the positions available are all really useable. So really, the main draw of this pedal is its simplicity. It covers a lot of the same ground as other chorus pedals, but you won’t have to spend as much time dialing in your tone. This pedal is both analog and true bypass. The pedal has a very warm, though slightly dark, tone. Unlike the original Small Clones, modern examples of the effect are true bypass. 91 out of 100. Incorporating 325+ ratings and reviews. The MXR M234 provides exactly what you’d expect from an analog modulation pedal. The chorus effect is warm and lush, and while the pedal is obviously going to impact your tone it is still relatively transparent. 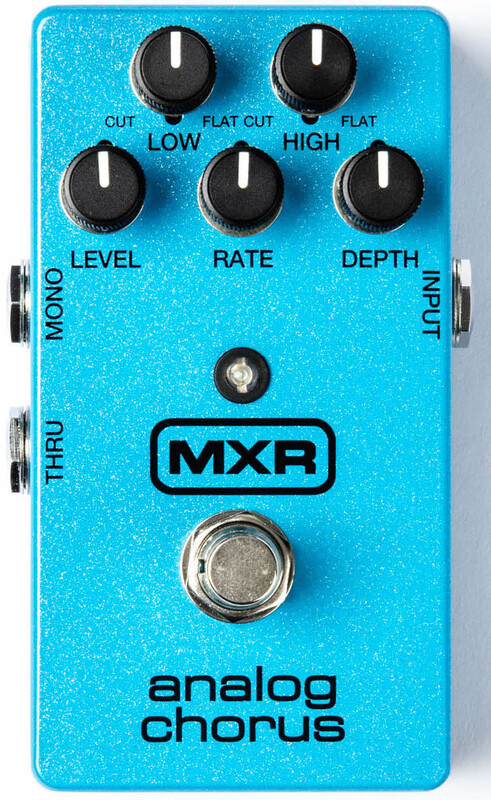 The cool thing about the MXR M234 Analog Chorus is that in addition to the controls you’d expect to see from a chorus pedal (level, rate, depth) it also has both a low and hi-cut. These two knobs are tone controls, cutting low and high-end frequencies respectively. Dimensions: 5.5" x 2.5" x 4.5"
Something to know about this pedal before you buy it is that it does use hardwire bypass. Hardwire bypass is where your signal still runs through the pedal even when the effect itself isn’t engaged. This increases the length your signal has to travel, which in turn can result in a loss of high-end frequencies. Lastly, the MXR234 really is a durable pedal, the benefits of which should not be understated. If you want to gig, and you don’t live in a huge music town, your band is going to live or die based on your reputation. Because of this, if you’re a gigging musician you can’t afford to have gear that will let you down. The pedals below are all phenomenal, though don’t feel that spending more than $100 is a requirement to get a good tone. 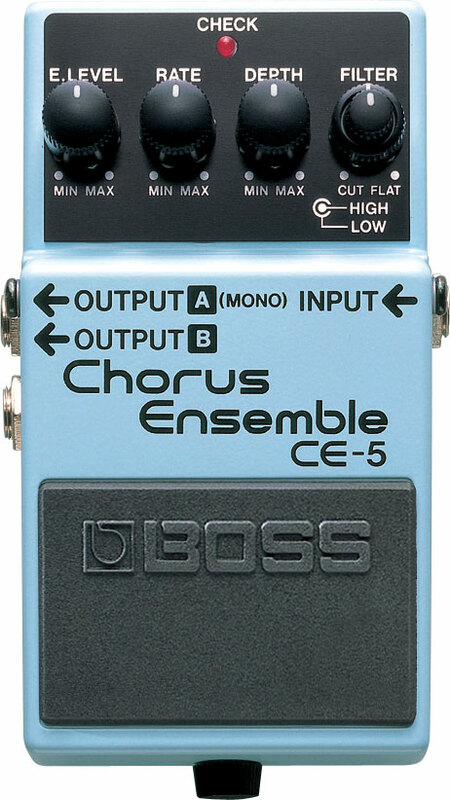 The Boss CE-5 Chorus Ensemble is a digital chorus beloved for its flexibility and bright tone. Like other Boss pedals, it’s also incredibly durable and reliable. There’s not really much to complain about with the pedal, though there are a few factors that will make it work better in some situations than others. The first thing that you have to understand about this pedal is that it is pretty digital sounding, which isn’t a bad thing. The great thing about digital modulation effects is that they’re very clear, which allows them to pair well with darker amps and pickups. However, depending on the gear you use the “digital-ness” of the pedal may sound a bit thin. Dimensions: 5.1" x 2.4" x 2.9"
Another thing to know is that this pedal, like others made by Boss, is that it has buffered bypass. The cool thing about buffered bypass pedals is that they boost your signal. This comes in handy if you’re running a longer chain, though if you’re using a shorter change it may alter your tone somewhat. Interestingly, the CE-5 also comes with a filter control. This is basically a tone control for the chorus effect, so should you need to you can make the CE-5 sound a bit warmer. It’s not going to make it sound like an analog pedal, but it can roughly approximate one. Lastly, the unit also has a stereo output. This allows you to run the effect through two different amps, which can make it sound wider (you really need to hear the effect in person, as it’s not really something that’s easy to describe). 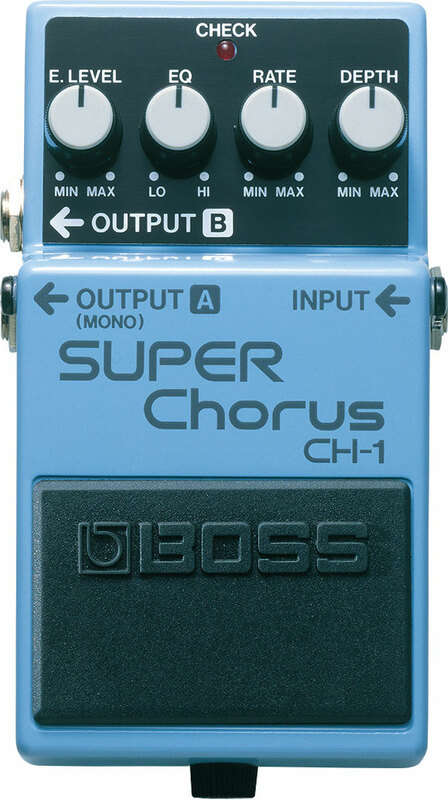 The Boss CH-1 and the Boss CE-5 are very similar pedals, with the majority of the controls and specifications being the same. For example, the CH-1 has a control for the volume of the effect, its tone, the rate of the chorus, and the amount the chorus effect “detunes” your signal. The debate between which unit sounds better seems to be almost entirely subjective, and a lot of the opinions held by musicians seem to contradict each other. However, the main difference noted is that the CH-1 seems to be a better option for more subtle levels of chorus while the CE-5 handles more extreme levels better. Another thing to note is that, like the CE-5, the CH-1 is going to have a digital tone. The unit has a very bright sound and a clear presence in the mix, though there are reports it can be a bit sterile sounding. Lastly, the pedal is a stereo unit. This allows the effect to drive two different speakers or amplifier simultaneously. 91 out of 100. Incorporating 375+ ratings and reviews. Pedals from TC Electronic are hard to review, because as a general rule they all come preloaded with TC Electronic”s TonePrint software. TonePrint is software that allows users to either modify parameters of their effect (which varies from pedal to pedal) and/or use other user's presets. Though while the versatility of the pedal is impressive, it should be noted that if you’re not willing to take advantage of the TonePrint software you may be better off with either a cheaper pedal. A lot of musicians don’t really want to be bothered with having to tweak their pedal, and in that situation you don’t receive any benefit from the TonePrint software (so you’re paying extra for something you don’t really need). Dimensions: 4.8" x 1.97" x 2.83"
However, the stock settings on the pedal are definitely serviceable. The pedal handles everything from a subtle warble to luscious chorus admirably. The unit does have a pretty digital sound, though this can somewhat be adjusted with the unit’s onboard tone controls. Lastly, the unit is able to run in either true or buffered bypass mode. This allows you to switch between the transparency you get with true bypass and the signal boost you get from buffered, depending on which works better for your situation. The MXRM134 is a very versatile pedal, capable of covering a huge variety of different chorus tones. The unit has an overall total of six controls; five variable knobs and an on/off bass filter switch. The unit, like other effects made by MXR, is also very durable. The main flaw in this pedal is that the two controls of the pedal which are arguably most impactful aren’t intuitively labeled. The controls in question are: the bass filter and the intensity control. The bass filter (which isn’t labeled) reduces chorusing on the low-end signal, resulting in a much brighter tone. The intensity controls the mix of the dry and chorused signal. Barring that, the unit is definitely going to be a hit with those of you looking for a solid analog chorus. It’s definitely capable of producing that “wet” and pronounced chorus that defines shoegaze genres, as well as the subtle chorus found in modern genres. A key selling point of the unit is that it can actually cover the tonal range of an analog chorus as well as approximate the brightness you find in digital units, making it a great fit for those of you who are looking to cover a lot of ground. The Boss CE-2W Waza Craft Chorus pedal is a combination of the famous CE-2 and the CE-1 (both the vibrato and chorus effects). Right off the bat, the first thing to know about this pedal is that it does a pretty solid job of approximating the tone of these vintage effects. So, if you’re looking for that 80s chorus sound this would be a good place to start. But the question is: Does this pedal stack up against its modern competition? When looking at demos and reviews of the pedal, it really isn’t lacking in any way. The tone is rich and vibrant, and unlike a lot of Boss pedals the CE-2W is analog. Dimensions: 5.12" x 2.87" x 2.37"
A possible flaw with the pedal is that there are only two controls: rate and depth. Though to be fair, dozens of albums have been made with pedals that only have these two controls. So it is limiting when compared to pedals that do have these features, but at the same time it won’t prevent you from dialing in a good tone. 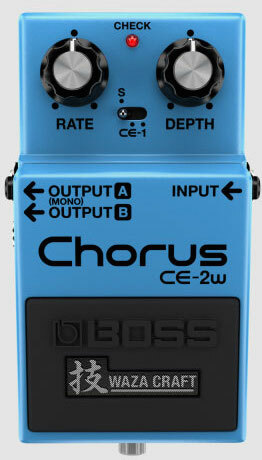 Unlike the original release of the pedals mentioned above, the Boss CE-2W allows you to operate the effect in stereo. If after looking through our recommendations you’re still not sure which unit will be the best chorus pedal for your needs, check out the sections below where we go over the effect in more depth. Unlike a lot of other hobbies, instruments and effects don’t have a linear improvement in quality as price increases. Effects pedals in particular are subject to a high rate of diminishing returns, so once you get past a certain price point ($50 generally) you’re not going to be experiencing large jumps in quality. 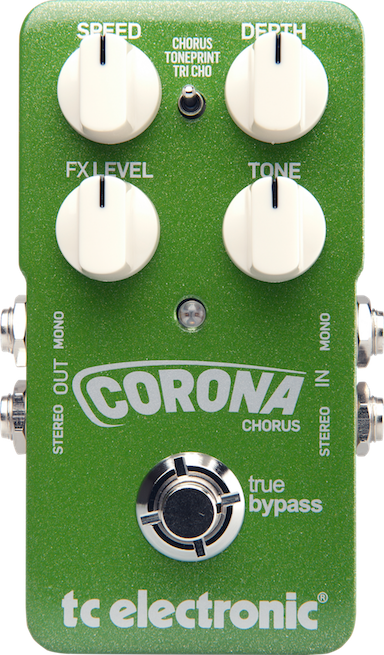 In the case of chorus pedals, as you spend more money you generally get a couple more features; most notably a time and feedback controls as well as an expression pedal input. Time controls the time it takes for the modulated signal to be heard, and feedback adds in resonance to the tone. An expression pedal allows you to control a parameter with a foot pedal. Note that you get an increase in features, not an increase in tone quality. If you’re going to use the extra features provided by more expensive units the increase in cost may be worth it, but if you’re not you will generally be better off getting a highly reviewed pedal with a more minimalist control layout. The debate between analog and digital has always been a point of contention in guitar playing circles. Some musicians feel that digital effects don’t have an “organic” tone, while others feel that the relatively bright voicing of digital helps their signal cut through the mix. There is a technical difference between an analog and digital chorus, but it’s incredibly technical. In summation, use your ears to make your decision. Just use the knowledge that an analog chorus will be a bit warmer than a digital chorus to help you narrow down your search. Something that many musicians are concerned about is the bypass configuration of their pedals. Bypass is the path that your signal follows when an effect is disengaged. A buffered output boosts the signal as it leaves the pedal, and true bypass allows your signal to pass through the pedal without running through its circuitry. A lot of musicians feel that true bypass prevents tone loss, which is true to some extent. Your guitar signal gradually degrades based on the length it travels, with notable degradation starting around 12 feet of length. So true bypass helps to reduce the distance, which in turn reduces tone loss. Buffered bypass boosts the signal, reintroducing the high-end frequencies that are lost as the signal travels. The only bypass configuration that’s really limiting is hardwire bypass, where your signal passes through the pedal without being boosted. The generally accepted order of an effects chain is: compression, filter (wah), distortion/overdrive, modulation (chorus, flanger, vibrato), delay/reverb, and volume pedals. However, many musicians change up the order of effects based on the tone they want. Think of it this way: you have a continuous signal that it modulated based on the pedal the signal passes through. The modulation used carries through the chain. For example, if you have a distortion before a chorus (and both are engaged) your distorted signal will then be modulated. With so many effects available there are a ton of different configurations available, so in order to really know which order of effects works best for you you’re going to have to experiment. We considered all the standalone chorus pedals available from major online US music gear stores and short-listed 23 of them for further analysis - you can see many of them in the Music Gear Database. We then collected ratings and reviews from online stores, forums, videos and major music gear publications and processed those data with the Gearank Algorithm to produce Gearank scores out of 100 for each of them. Finally we broke the list down into price brackets and selected the highest rated ones to recommend above. For more information about this process see How Gearank Works. Submitted by PR (not verified) on Apr. 29, 2018. 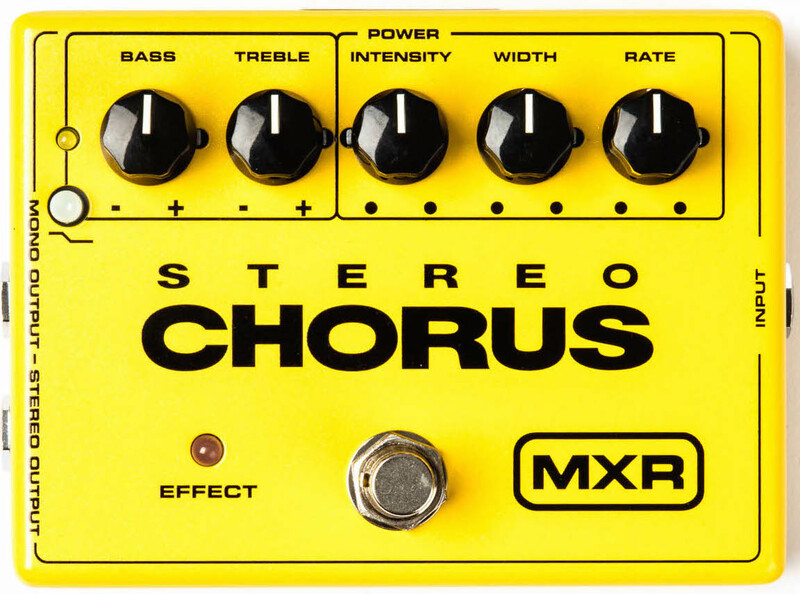 According to the "MXR Bypass List", both the Stereo Chorus and the Analogue Chorus are buffered. Submitted by Jason Horton on May. 31, 2018. Due to begin discontinued, we have removed the following chorus pedal from the recommended list above, but you can still read what we have to say about it: Moog MF Minifooger Chorus Pedal.